Peggy Tubb doesn’t recall her exact reaction when she was told she could stop taking blood thinners to treat atrial fibrillation (AF), but the news changed her life. She is among the more than 50 patients at Vanderbilt Heart and Vascular Institute (VHVI) who received the Watchman LAAC Closure device, designed to reduce the risk of stroke in patients with non valvular A-Fib, the most common form of arrhythmia. Patients with AF have an increased risk of stroke because blood can pool and form clots in an area of the heart called the left atrial appendage, or LAA. A clot can break free from the LAA and travel to other parts of the body causing a stroke. VHVI began offering the implantable device in 2015. 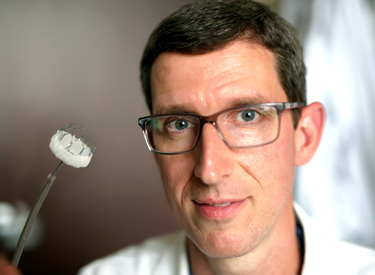 The center is fast becoming the largest program in the state and Southeastern region, with the highest volume and top outcomes, according to data from Boston Scientific, the company manufacturing the Watchman occluder. For more than 50 years oral blood thinners were the only intervention for reducing the incidence of stroke in patients with A-fib, said Christopher Ellis, M.D., associate professor of Medicine at Vanderbilt University Medical Center and director of the LAA Closure Program. “Although effective, blood thinners carry a significant rate of bleeding complications, and we are finding that as many as one-third of patients stop taking their prescribed doses after one year because of adverse bleeding, fear of complications and cost of the medication. While VHVI has a comprehensive program offering a variety of LAA closure options for AF patients, the Watchman device is growing in popularity as an alternative to treatment to reduce AF-related stroke risk and avoiding the need for long-term use of blood thinners, Ellis said. Tubb can attest to that. “There was a waiting list to have it put in,” said Tubbs of Smyrna. “I was told that I was approved to receive it, but it would be a few months before they could get me in. The date happened to be the day after my birthday, which turned out to be a great present. In 2015 the FDA approved the Watchman for use in the United States. It has been used throughout Europe for more than a decade. The procedure is performed under general anesthesia, typically takes less than one hour and requires a 24-hour hospital stay. The device, a quarter-sized, mesh cap, is inserted through a catheter in the femoral vein (in the leg) to the heart. Once the catheter reaches the LAA, the device is secured into place forming a tight seal. The implant team, which includes Rob Piana, M.D., professor of Medicine, and members of the transesophageal echocardiogram and cardiac anesthesia teams, help ensure accurate sizing for the device as well as facilitate with the implant procedure. “It is essentially a plug for the opening where the blood typically pools,” Ellis said. “Once the Watchman is in place it will close off the LAA, blocking blood clots from entering the bloodstream. LAA closure is the only therapy to offer patients both stroke protection from their A-fib and reduced bleeding risk of potentially dangerous anti-coagulants. AF affects more than 5 million in the U.S.
Ellis expects VHVI to implant between two and four patients a week.